1. Heat oven to 375˚F. 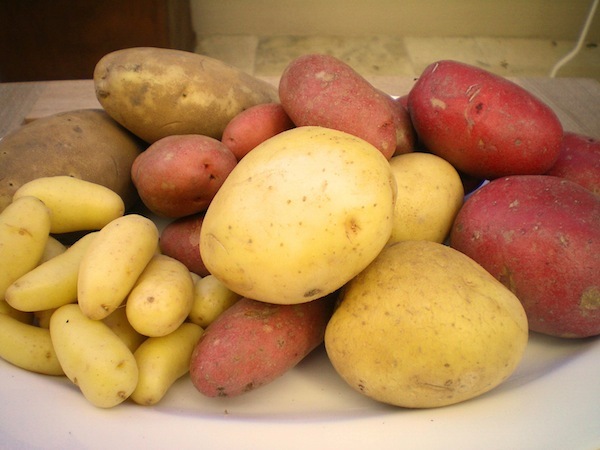 Rinse potatoes, dry them, and rub with salt. Set them on the oven rack and bake until tender when pierced with a skewer, 45 to 55 minutes. Remove potatoes and leave the oven on. 2. While very hot, cut a lid lengthwise from the top of each potato with a serrated knife. Taking care not to split skins, scoop pulp into a potato ricer or food mill over a saucepan; set potato shells and lids aside. Work pulp into the saucepan and add butter, salt, pepper, and all but 4 tablespoons of cream. Beat potato over high heat with a wooden spoon so it forms a soft, light purée, 3 to 5 minutes. If too runny, keep cooking the puree until slightly thickened. Taste and adjust seasoning. Fill purée back into potato shells halfway to the top. Using a spoon, create a small hollow in the purée. Some will be leftover for another use – for instance it is an excellent thickener for soup. 3. Break an egg into each hollow and spoon over remaining cream. Bake potatoes in the oven until the eggs are lightly set, 20 to 25 minutes. Serve at once, on warm plates, with a potato lid perched on the side. Serves 2.